Protein function is generated and maintained by the protein homeostasis or proteostasis network (PN) [(Science (2008), 319:916; Powers et al. (2009) Ann. Rev. Biochem. 78, 959; Curr. Opin. Cell Biol. (2010) Dec. 3 (Epub ahead of print)]. The PN is a modular, yet interactive system unique to each cell type that is sensitive to signaling pathways that direct development, regulate aging and respond to folding stress and disease to maintain human health and lifespan. 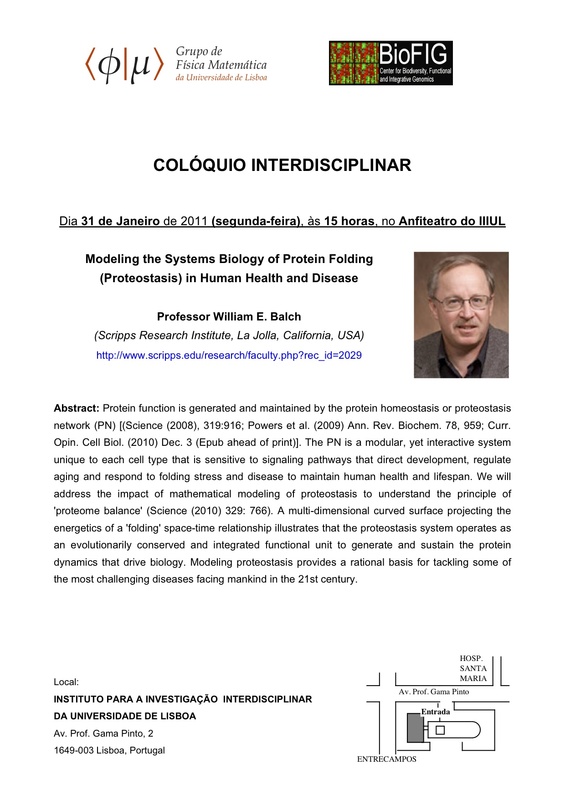 We will address the impact of mathematical modeling of proteostasis to understand the principle of 'proteome balance' (Science (2010) 329: 766). A multi-dimensional curved surface projecting the energetics of a 'folding' space-time relationship illustrates that the proteostasis system operates as an evolutionarily conserved and integrated functional unit to generate and sustain the protein dynamics that drive biology. Modeling proteostasis provides a rational basis for tackling some of the most challenging diseases facing mankind in the 21st century.